The Hebrew creation account uses five times as many continuing action as completed action verbs. Imperfect verbs and participles show actions that are incomplete or continuing. They may be rendered in English with words like continued, proceeded, kept on. When the creation text uses verbs of this type, it often shows God commanding actions conducted by things He continued to form on previous days. Neither the grammar nor the described events support the traditional Latinized short duration single commands and actions. God uses the metaphor of a birth, the the sea (singular noun) emerging from the womb. When the sea emerged, it was swaddled in thick clouds. The seas (plural) were gathered into one place, underground, on day three. The surface waters percolated underground, which allowed the dry land to appear. This fits the metaphor of the sea being enclosed by a lid. On day two, God continued to command a spreading (raqiya) atmosphere to continue to separate the waters above from surface waters. The waters above the atmosphere were solid, evidently in the form of ice (Proverbs 8:27-28). Also on day three, God continued to command the ground to sprout plants. Some of the plants grew into trees that produced fruit and reproduced themselves in a single afternoon, before the Sun began to form. These are not evidence for one time commands or creations. On day four God kept on forming the Sun, Moon and stars and continued to make them into things that spread out (raqiya). The evidence for day four is overwhelming since we can see, with telescopes, the creation era. By comparing the shapes of galaxies at many ranges, we observe how stars continuing to form, emerge and spread out, evidently from the unformed matter God created first. Billions of galaxies continued to grow from tiny globs into huge, growth spirals as the stars continued to form and spread out. The stars’ volume and their orbits are both observed to spread out. Why don’t our translators mention the continuing processes as God continues to command inanimate substances to act? Modern Bibles follow the long tradition of the Latin Vulgate. The Vulgate renders God’s commands for day five with dixit, his creation of the sea creatures with creavitque and his blessing with benedixitque. These are Latin perfect verbs as though God speaks, creates and blesses with one-time, short-duration commands. Genesis 1:20 – 23. And Elohim continued to say, let the waters continue to bring forth creatures that continue to move and fliers that continue to fly over the earth on the face of the spreading place (raqiya) atmosphere. And God continued to create great tanniyn and every creature that moves in unbroken continuity that the waters brought forth (multiplied – completed action) after their kind and every winged bird after its kind. Elohim continued to see that it was good. Elohim continued to bless them, be fruitful and multiply and fill the water in the seas and let birds continue to multiply on the earth. Evening and morning – day five. This is not abiogenesis: organisms spontaneous forming from lifeless matter. At God’s continuing commands, lifeless water continues to produce creatures that continue to move and reproduce themselves. We find only one perfect verb for day five. The waters swarmed (multiplied) with moving creatures, which is not a word for a finished action. It shows continuing reproduction until the waters and the air were filled with creatures that reproduced after their kinds. How long did this reproduction last? It began on a single day, day five. Apparently, by the end of day five, the subterranean seas and the spreading atmosphere were swarming with moving creatures that multiplied after their kinds. All animals are still obeying the Divine imperatives to be fruitful, to multiply and to fill the earth by continued multiplication. Modern people are trained to only think with western assumptions that are radically different from the thinking of all people in Moses’ era. The ancients had a non linear view of earth history: that their ancestors lived for eons but days and years continued to degenerate for succeeding generations. Job who lived in the dinosaur age, described the various geological markers that passed in few days, during his lifetime (see the Hebrew text for Job 14). Job used the dried sea (Hebrew west) as one of the markers for the duration of life. 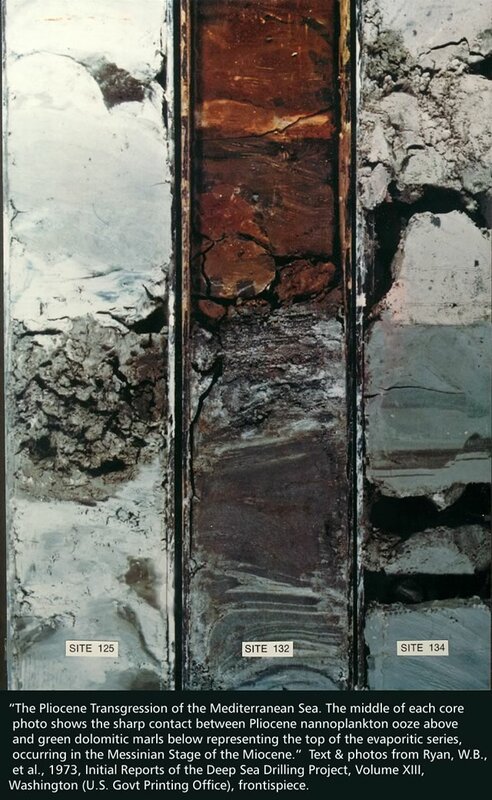 Indeed, drill cores show that the Mediterranean dried eight times leaving layers of salt and gypsum sandwiched between deep sea oozes. The photo on the right shows the transitions between deep sea oozes and dried sea evaporites, such as carbonate dolomite. The photograph is from Ryan, W.B. et al, 1976, and came from the NOAA web site. Click on the image to see the full size. Scientists estimate that the last time the Mediterranean dried was 5 million years ago. Job lived about 4000 years ago,according to biblical genealogies. Job also said their faces doubled (shana paniym) before they died. The bones of our skull are the only part of our skeleton that keeps growing as we age. If we lived for geological ages, our faces would grow Neanderthal brows. This Neanderthal skull of an old man came from Gibraltar. It has extended brows because, as Job claimed, he lived to observe vast geological changes. Neanderthal child skulls look like our skulls, not like their grandparents. The picture is licensed under Creative Commons Attribution Share Alike by AquilaGib from wikipedia. If you interpret creation in the ancient system, as a contemporary of Moses would, the age of the universe is not a problem. The Bible consistently calls the Old Testament era: olam, the eons. The gospel was hidden for long ages (Romans 16:25). The Scriptures were written for us, upon whom the close of a series of eons has come (1 Corinthians 10:11). Jesus came at the end of the eons (Hebrews 9:26). Peter said the plural heavens came out ek-palai – long ago (2 Peter 3:5). In our era, our time is short [kairos sustello] of limited duration, contracted, drawn together and abridged (1 Corinthians 7:29). If you do not understand what causes days and years to continually accelerate as orbits spiral out, consider the issue of gravity aberration which is explained on this web site. The Bible is consistent with the simple, visible evidence once we eliminate the false principle upon which western science was contrived. During the Old Testament era, people people everywhere believed that days and years become shorter and worse for each succeeding generation. Please read the worldview of ancient people, such as how each generation lived shorter lives in Hesiod’s Works and Days. The book of Genesis also records how each generation lived shorter and matured faster. Jacob also believed that days and years get shorter and worse for succeeding generations Genesis 47:9. 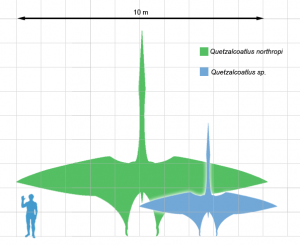 The picture from wikipedia shows the wingspan of giant pterosaurs. Their wingspan was as large as that of a modern fighter jet. Scientists cannot understand how such huge creatures could fly because they reason with a creed, that matter and orbits are NOT continually changing, changing together, relationally. The drawing is from Matt Martyniuk, Mark Witton and Darren Naish and is licensed under a Creative Commons Attribution 3.0 Unported license. God created the tannin – the great sea monsters and the flyers that fly in the spread out atmosphere on day five. 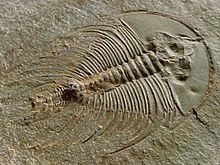 At the head of this article is of a fossil of an Olenellus Fowleri. This creature lived on the bottom of shallow, underground seas long ago that used to exist on the continents. God commanded the waters to swarm with such creatures on day five. The picture is under the GNU free documentation license from wikipedia.